With the release of Dragon Ball FighterZ , we wanted to take a look into the history of Dragon Ball’s fandom and the Fighting Game Community. Dragonball has enjoyed success and a healthy fan base since its introduction to the weekly Japanese comic magazine Shonen Jump in the mid 1980’s. Dragon Ball starred Goku, a curious young boy who went on whimsical adventures with his friends in search for the elusive Dragon Balls. The character borrowed heavily from Sun Wukong, the main character from Journey to the West.He had a tail, an extending pole and a flying cloud he could travel on. The series was turned into an anime in 1986 and was a hit with audiences. The creator of Dragon Ball, Akira Toriyama, quickly became a household name in the manga and anime world with his distinct art style and storytelling. When Dragonball Z released in 1989 the series took a dramatic change in tone and pace. Dragonball Z had an adult Goku, battling villains who exponentially grew in strength and power in a constant “fate of the world” scenario. Both series crept their way across to other parts of the world, first hitting the fansub scene in the early 90s. People would take VHSs or Laserdiscs (ask your grandparents kids) and subtitle the dialogue the best they could onto a copy VHS.Fansubs were sold or traded at conventions and eventually online The quality was poor at best and the subtitles were rarely perfect but fans were ravenous for any content they could get their hands on. A small but passionate fanbase was born then, one that has only become more intense as time has passed. In 1996, Funimation released an English dub of the series to American airwaves, igniting the same passion of the fansub community to a whole slew of people. An almost audible slamming of the breaks occurred when sans were met with an abrupt stoppage midway through the Frieza Saga, an early storyline in the series. Instead of finding out how Goku would fare against the evil Lord Frieza the series started over again. It was a hard pill to swallow for the community and the rest of the series wouldn’t hit American airwaves until years later. Until then, fans had to make do with fansubs or watching the same episodes ad nauseam. When Street Fighter II was released in arcades it disrupted the entire scene. 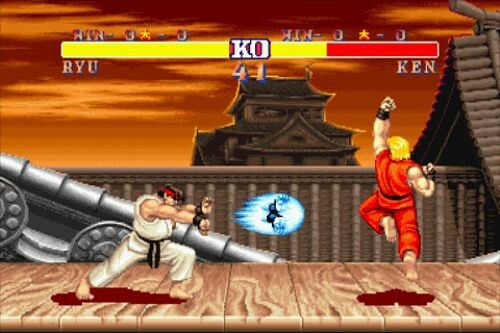 It featured combatants from around the globe and each one, with the exception of Ryu and Ken, had their own unique fighting style. Players could play against the computer in or against another player. Street Fighter II was fast, loud and mean. An average player could win a couple of rounds by mashing buttons as best they could but eventually the game or another player would out fight them. To get better at the game you had to learn your character’s special moves. Every character had a moveset that added another wrinkle to their technique. The caveat to that was, at first, nobody knew the moves. The game would taunt you during the demo mode; fighters kicking like a hurricane,orbs of blue energy shooting from outstretched hands, men spewing pillars of fire. People would watch, enthralled, trying to decipher the minutiae of each move. You couldn’t go to the internet to find out, the information wasn’t posted on the arcade cabinet, you had to learn on your own. Players would share their knowledge they gained in school cafeterias, offices and at the arcade. Eventually, the moves were unlocked in the minds and hands of players. Arcades and homes alike would be filled with the cacophony of what was once a mysterious art. Arcades became dojos for aspiring fighters. New players would be shown the ropes by the veterans, always with a generous helping of “tough love”. Soon arcades were brimming with a stable of contenders, each having their own main character they gravitated to. Players would try new strategies out during matches, always trying to keep ahead of their opponent and help the scene stay fresh. The Fighting Game Community, A.K.A the FGC, was born. Soon, tournaments became the norm at arcades, players taking all of their expertise to the highest level. The tournaments were typically small, players huddled around a arcade cabinet,trying to catch a glimpse of their competition. One of the more notable tournaments,was Battle by the Bay, where forty participants fought for dominance in Street Fighter. If there was a Venn diagram with DBZ fans and the FGC displayed, the graph would almost resemble a single circle. Fans of both were hungry for anything they could get their hands on, especially when the series was tailor made to be adapted into a fighting game. Ultimate Battle 22 for PSX was released in Japan in 1995 and gave fans a taste of what they were looking for. The game featured 27 characters drawn by the animation team and voice acting from the show. Unfortunately the game was slow and clunky, which was unforgivable considering the show featured lightning quick brawls. Despite this,American import shops found it very popular with the DBZ community. Fans didn’t care that the game made Pit Fighter look like a game of the year contender,they just wanted to have a way to duke it out with their favorite DBZ characters. The sad truth was that, most towns didn’t have an import shop so the average fan either couldn’t get a copy or didn’t know the game even existed. Even when the 1997 U.S. release of Dragon Ball GT- The Final Bout fans were met with another clunky game that could hardly be considered presentable. Even worse, the game was limited to a 10,000 copy release, ensuring that most fans would either have to desperately hunt it down or miss out on the sub par experience. The FGC needed a Dragon Ball Z game that was easy to obtain, with solid mechanics that could be used for tournaments. M.U.G.E.N. was released on the internet in 1999 as a way for people to create their own custom fighting games. Aspiring programmers could import a character from any fighting game they wanted into the system. Wanted to see how Spiderman from Marvel Vs. Capcom stacked up against Hoahmaru from Samurai Shodown? Here was your chance. The best part of it all? It was released 100% free to the public, all you needed to do was download it then futz around to your liking. Much like the fansub community that came before it, dedicated DBZ fans filled the need for the community at large. Quickly Dragon Ball Z characters were popping into M.U.G.E.N. and fans finally had a capable fighter that pitted their favorite characters against each other. So many Gokus, but which one is right for me? Of course, once the FGC had their hands on the game, tournaments sprouted up. The scene was small but dedicated. Dragon Ball Z fans had a spot to throwdown with their favorite characters, which was a dream come true. Although M.U.G.E.N. helped DBZ fans get what they were looking for, and for free, it didn’t have the staying power that an official release would have.The tournament scene never really took off and soon players were ditching M.U.G.E.N. tournaments for their old favorites. DBZ fans didn’t get a good fighting series until the Budokai and Xenoverse games came out. Despite the games being immensely fun the games focused on fanservice rather than a tight fighting game experience. Tournament organizers felt the game was broken from the get go and competitive events were far and few between. Are you ready now to witness a power not seen for thousands of years? January 26th 2018, the FGC and DBZ fans finally had their wish granted. Dragon Ball FighterZ was released to the delight of the fanbase. Dragonball FighterZ was developed by Arc System Works, the same company that created the anime fighting game darlings Guilty Gear and Blaz Blue.The game combined the tight and technical controls that Arc System Works is known for with the beautiful art style and lineup from the Dragonball Z series.Finally fans had an official and proper fighting game for Dragon Ball Z that they deserved. The game looked beautiful, featured all the correct voice actors and had all the detailed technical points that the FGC loves. Tournaments rapidly spread across the globe, players eager to test out their dream team against each other. Arturo “NYC Furby” Sanchez, a well known FGC TO,quickly added DBFZ to his weekly Next Level Battle Circuit. The first event quickly grew a $1,000 prize pool and was number 4 on Twitch viewership that evening. Not too shabby considering he was competing with Overwatch League for eyes that evening. Dragonball FighterZ had only been out for eleven days when it was announced as part of the lineup for EVO 2018. The small 40 man tournament that started in the bay years ago had grown into the premiere FGC event of the year. What once was held a room in Sunnyvale had ballooned into filling up Mandalay Bay in Las Vegas with thousands of attendees. Thousands more would watch on Twitch or ESPN. FGC Dragonball Z fans, after over two decades of waiting, finally have their moment in the sun. A strong fighter that could be played in tournaments alongside the heavy hitters like Street Fighter and Tekken had come their way. Although the game is new, it will most likely be a fan favorite this year, with viewership likely being immense. Both the Dragon Ball fanbase and the FGC have one thing in common, pure devotion. Large scale tournaments like EVO wouldn’t be a reality if it wasn’t for players constantly improving their game,creating tournaments and growing the scene. Further iterations of Dragon Ball, like Dragon Ball Super, wouldn’t be around if it wasn’t for the fans showing their love and appreciation of the series. Dragon Ball FighterZ is a way overdue entry in the fighting game world and players are gorging themselves on the experience. It is almost certain that Dragon Ball FighterZ will become a dynasty series like Street Fighter, it has all the right parts and a dedicated baked in fanbase. It will be exciting to watch how the community grows, how the series evolves and how the tournament scene develops.